The genesis of this volume can be traced back to the surge of research prompted by the bicentenary of the abolition of the slave trade in 2007, via a conference hosted by English Heritage, the University of the West of England and the National Trust in 2009. Whether surveying areas near slave ports such as Bristol and Liverpool; connections with colonies such as Antigua or St.Vincent; or focusing on particular houses such as Brodsworth Hall in Yorkshire or Normanton Hall in Rutland, these studies both break the silence and provoke further questions. An unsanitized snapshot of British colonial slave ownership was taken by the Slave Compensation Commission, which distributed £20 million in compensation to slave-owners when slavery was abolished in 1833. David Cameron, Graham Greene, George Orwell and Elizabeth Barrett Browning were among the individuals that were revealed as descendants of slave-owners when the UCL Legacies of British Slave-ownership project launched a searchable online database based on these records earlier this year. Some country houses were built or renovated by men who had made their fortunes trading in slaves or from the proceeds of a colonial slave plantation, such as Harewood House in Yorkshire. Others benefited from slave-related profits in a more indirect way. Henrietta Howard of Marble Hill, invested in the South Sea Company (which supplied slaves to Latin America). Royal Africa Company investors included Josiah Child, who bought Wanstead in 1673. Dealing in slave-produced goods such as sugar, coffee and tobacco or holding an official post in the administration of the colonies provided other lucrative connections. A more tangible consequence was the presence of black servants living in country houses, such as Jasper, who lived at Oldbury Court, Stapleton, near Bristol, in the 1750s. Not all black people connected with country houses were in service. Caroline Bressey explores the fascinating stories of Dido Elizabeth Belle, who lived with her great-uncle Lord Mansfield at Kenwood and Lagos- born Victoria Davies, who visited her godmother Queen Victoria at Osbourne House. But neither featured in the on-site experience when Bressey visited in 2009. Hopefully Kenwood will incorporate the content of their 2007 Slavery and Justice exhibition, which featured a portrait of Dido, in new interpretation when the house reopens after refurbishment this autumn. Some country houses had links to abolition. The owner of Belmont, Wraxhall, Somerset, William Turner, subsidized the abolitionist activities of Hannah More when he settled an annuity of £200 on her in 1773 as compensation for breaking off their engagement. In 1834, anti-slavery campaigner Henry Wyatt erected an arch at the entrance of his new home, Farmhill Park in Stroud, Gloucestershire, to celebrate the Slave Emancipation Act of 1833. Farmhill Park, like many of the houses beautifully illustrated here, is no longer standing. Only four of the 24 properties near Liverpool discussed by Jane Longmore survive. This points up a certain incompatibility between the diverse contributors to this volume: lost houses are of more interest to scholars than to heritage professionals. The editors do not provide any concluding remarks to draw these disparate strands together. As Dresser and Hann admit, this is work in progress. New research must be incorporated into site interpretation. Further investigation is required into the hundreds of country houses built or refurbished during the long 18th century. Neither are the questions we must continue to ask and answer about the slave trade entirely academic: Caribbean leaders have recently approached a London law firm to build a case for reparations against the British, French and Dutch governments. Of course, not all British country houses had connections to slavery. But until the research is done to find out which ones did, the visiting public will continue to wonder about the slaves they imagine hidden in the dungeon. Download a free copy of the book (minus illustrations). 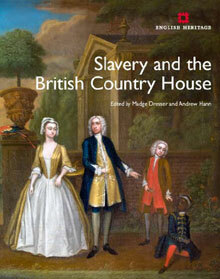 Read more about the research I did into English Heritage properties' connections to Slavery.